Located in Conwy County, Wales near the city of Colywn Bay, the Welsh Mountain Zoo is a 37-acre zoological park showcasing more than 100 different species of native and non-native animals. The Welsh Mountain Zoo was the vision of Wales wildlife enthusiast Robert Jackson, who wished to create a natural reserve to showcase the native wildlife of the United Kingdom among a collection of international species. Jackson’s campaign to secure a site and funding for the project dated back to the late 1940s and manifested as a series of seasonal animal attractions throughout resort areas in the United Kingdom, including Eirias Park’s Aquarium and Children’s Zoo. Following that attraction’s development, urban leaders approached Jackson with the possibility of renovating Conwy County’s former Flagstaff Estate site into a zoological park. Construction on the zoo project began in November of 1962, and the completed park was opened to the public in May of 1963. After Jackson was killed in a fishing accident in 1969, his wife Margaret and the couple’s three sons took over operations of the zoo, expanding facilities and programming throughout the following decades to include a lion enclosure, penguin pool, and otter habitat, as well as a red squirrel breeding initiative. In 1983, the Zoological Society of Wales nonprofit charity was created to oversee management of the park, which allowed for further expansion of habitats and programming. Today, the Welsh Mountain Zoo is managed and operated by the National Zoological Society of Wales nonprofit charity, which oversees all daily operations and programming initiatives. Though the zoo was declared the National Zoo of Wales in 2008, it retains its original name and is currently under the direction of Jackson’s son, Nick. More than 140,000 people visit the zoo annually, which showcases more than 600 animal residents representing more than 100 native and non-native species in habitats organized by species group and ecosystem area. 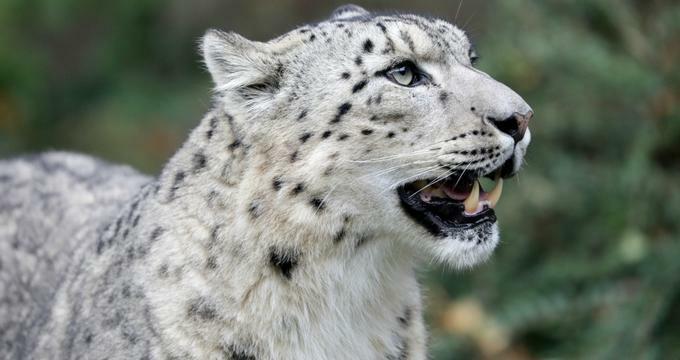 As a natural wildlife reserve, the zoo is home to a number of rare and endangered species from around the United Kingdom and throughout the world, including red pandas, chimpanzees, and leopards. A variety of animal habitats are showcased throughout the park, including a European Otter Enclosure, a Chimpanzee World and Chimp Encounter area, and a Condor Haven. Recently-added exhibits include Sea Lion Rock, which showcases the zoo’s population of Californian sea lions in a 300-square-meter pool and activity area complete with an underwater visitor viewing facility. A Lemur Walkthrough, added to the park in 2012, is the first of its type at any animal park in North Wales, allowing visitors to observe red-fronted and ring-tailed lemurs imported from the Edinburgh and Belfast Zoos from a walkthrough enclosure pathway or a number of viewing windows. Habitats and exhibit areas for native species, including the Welsh mountain goat, are also showcased. Other mammals showcased throughout the park include the Bactrian camel, the Przewalski wild horse, the Lar gibbon, the Oriental small-clawed otter, and the African crested porcupine. An African Aviary exhibit features populations of pigeons, starlings, and village weavers, while other habitat areas showcase Andean condors, Chilean flamingos, and scarlet, green-winged, and blue-and-yellow macaws. Reptiles on display include the royal and Burmese pythons, the Mississippi alligator, and the red-eared terrapin, while amphibian displays showcase animals such as the African bullfrog. An invertebrate exhibit also showcases tarantulas and giant land snails, and a Children’s Farm area allows young visitors an opportunity for up-close experiences with chickens, ducks, rabbits, turkeys, and guinea pigs. Future park developments include a Wallaby Enclosure and a new house for subtropical reptile species. Other zoo amenities include a cafe, gift shop, Jungleland Adventure kids’ play area, and parent and baby room facilities. In addition to field trip opportunities for primary and secondary school students, the Welsh Mountain Zoo, a variety of educational programs are offered for the North Wales community, including in-classroom outreach programming bringing zoo animals directly into the classroom for student meet-and-greet experiences. The zoo’s WILD Education Centre, redesigned in 2016, hosts educational workshops and public event programming and includes an interactive Media Centre available for use by up to 30 students at a time. An annual Young Zoologist Days summer program is offered, along with a work placement program for North Wales teenagers. Periodic public special events are also offered in conjunction with school, summer, and winter holidays. Visitors may book birthday party packages directly through the zoo’s offices, which offer catered meals from the zoo’s cafe for all party participants and a variety of add-on workshops, including animal encounter experiences and question-and-answer chats with zookeepers.